Posted By PA Breast Cancer Coalition on July 14th, 2016 at 9:43 am | 0 comments. 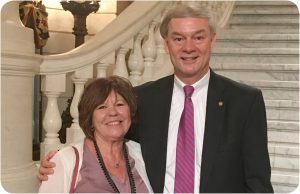 PBCC Director of Patient Advocacy Dolores Magro spoke with oral chemo parity bill author Rep. Matt Baker at a recent press conference held by the PA Cancer Treatment Fairness Coalition at the State Capitol. Governor Tom Wolf just signed a bill that helps with the high costs of oral cancer treatment for patients in Pennsylvania. Rep. Matt Baker’s House Bill 60 specifically addresses the cost disparity between intravenous and oral cancer treatments. Previously, oral cancer medication was covered under an insurer’s pharmacy (drug) benefit, often requiring patients to pay thousands of dollars per month, out-of-pocket. Now, oral treatments will be covered the same as intravenous medications on an insurer’s medical benefit, which means patients will only be required to make a fixed co-payment. Rep. Baker, a 2015 PBCC Pink Ribbon Awardee, authored the oral cancer treatment parity bill and has been working to pass the legislation for years. The following legislators were also instrumental in the passage of the bill: Sen. Tommy Tomlinson, Senate sponsor of oral cancer treatment parity legislation, Sen. Pat Vance, chair, Senate Health and Public Welfare Committee, Sen. Don White, chair, Senate Banking and Insurance Committee and Rep. Kerry Benninghoff, chair, House Cancer Caucus. According to Rep. Baker, Pennsylvania now joins more than 40 states and Washington, D.C., in having enacted legislation to control out-of-pocket oral cancer treatment costs for patients. Connect and Learn: Attend the 2016 PBCC Conference! Posted By PA Breast Cancer Coalition on July 14th, 2016 at 9:26 am | 0 comments. The people you meet, the relationships you build and the knowledge you gain from the PA Breast Cancer Coalition Conference make it a truly one-of-a-kind experience. Want to be a part of it? We invite you to join us Monday, October 10, 2016 at the Hilton Harrisburg for a day of connection, education and fun. This year’s workshops will cover everything from survivorship to lymphedema to palliative care to yoga, meditation and more. Are you caring for a loved one with breast cancer? New for 2016: The PBCC offers a special caregiver registration for $25. Simply list the survivor you’ll be joining and attend at the discounted rate. Thanks to the generosity of our incredible Grassroots Partners, we are able to offer 3 FREE Continuing Education credits for nurses, social workers and radiologic technologists. Plus, don’t forget to mark your calendars for our free Pink Party Sunday, October 9 at 6pm. Kick off the Conference in style as we honor Grassroots Partners and breast cancer survivors! 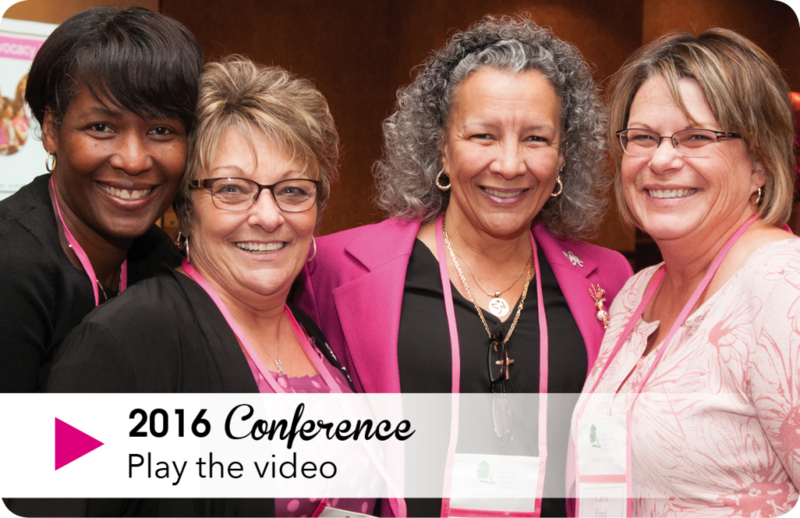 To help you learn more about what to expect at this year’s PBCC Conference, click on the short video below. Susan’s workplace, Amerihealth Caritas, hosts a Pink Week which has raised tens of thousands of dollars for the PBCC’s programs and services! My beautiful sister Janet was a hospice nurse for many years. 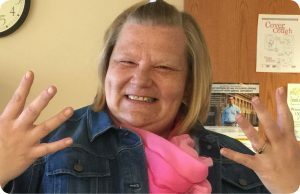 She would tell her patients that her sister Susan was the luckiest person she had ever met. That’s because I was doing the unhealthiest thing a person can do. I was smoking when I discovered a lump the size of a baby pea in my breast. In March 2007 I learned that I had breast cancer. I might have had a clue about that since it runs in my family, but I truly never thought I’d get it. My sister Karen says I live with the pixies and that I completely deny anything unpleasant. That true, but I wasn’t so much in denial that I didn’t get regular mammograms. For years I said it will skip us, my sisters and girl cousins and me, and by the time my nieces get older they will have cured it, but that didn’t happen. So I learned that I would be living without the two things that entered a room before me since the age of 15. They were big, and heavy, and incredibly squishy soft; I loved them. Unfortunately, the girls had to go. I remember standing in the shower the morning of my surgery and washing them for the last time, and I could not visualize what it would be like without them. I thought I would never leave the house without the fake ones in. I learned that was wrong too. Those jokers itch and when you’re healing you don’t want something itchy next to your skin. So I started going out without them. Suddenly my belly seemed enormous whereas before it, it had provided a kind of resting place for my boobies…I told you they were heavy. I also learned something really awesome in the process, not wearing a bra is GREAT!!! Seriously, it rocks. I learned during that first year that I would assess my life in terms of quality and not longevity and therefore I would not take chemotherapy. This decision confused and even angered people who love me, but it’s my life and I need to live it as I see fit. It was not because I did not want to lose my hair. It was because chemo is a horrible thing to go through, and I simply did not want to do it if I did not absolutely have to. I learned that beauty can be painful with the first step of my reconstruction. When the expanders went in and I could not roll over to get out of bed, I was freaking out because it hurt like a beast. I learned that when you cough or sneeze after a procedure like this, you make sure you fold your arms over your chest, covering your new breasts. I learned that I did not want to be seen as a victim to this thing that invaded my fairy-like existence. So I chose to ignore the unpleasantness and plow forward. I talked openly about my situation so others would feel at ease. If I felt weird about it, they might also. I asked people if they wanted to feel my chest once the expanders were in; men and women both. I never asked why me, because I already knew the answer. Why not you Susie baby, why not you? God does not make mistakes, and bad stuff happens all of the time to people who don’t deserve it. That is life. No one’s life is pain free. Maybe I got it because I had the strength and support to handle it. God knows why and I don’t need the details. Suffice it to say, I get a new rack out of the deal that will never sag. So let’s call it a day. After a while it was my turn to give back. So I started with some wonderful people in my company, Ameriheath Caritas to raise money for the PBCC. Every year in October we hold a week of activities called Pink Week to raise awareness and funds for the PBCC. People are very generous and we raise over $5,000 each year! It is my great pleasure to do so because the PBCC is committed to finding a cure. The most important thing I learned is that I was loved. I knew I was loved before this happened, but that year all of the love I had in my life leapt on me, threw me down on the bed, and kissed me all over my face. People called me, cooked me a freezer full of meals, sent cards, flowers, and gifts. They cleaned my house and did my laundry. They held my hand and changed my dressings. They kept my dog while I recovered and gave me sick time so I would still get paid. They laughed with me and held me and told me I was beautiful. You can have a wonderful life after cancer because, if you’re like me, you learn to say what you mean, to do what you say and to know that you need to do what you really want to because life is not a do over, this is it. You make the most you can out of it while you can. Posted By PA Breast Cancer Coalition on July 14th, 2016 at 9:25 am | 0 comments. 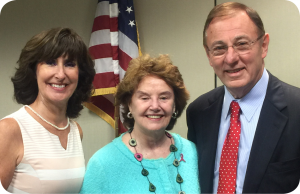 PBCC President and Founder Pat Halpin-Murphy was among doctors, patients and advocates invited to the Cancer Moonshot Summit at Fox Chase Cancer Center on June 29. The national effort spearheaded by Vice President Joe Biden aims to advance cancer research, increase patient access to treatment and to support patients across the country. The ultimate goal of the Cancer Moonshot is to double the rate of progress toward a cure for cancer. The PA Breast Cancer Coalition was honored to be part of this historic event! Click here to watch Vice President Joe Biden’s remarks from the summit. Click here to watch the recording of Fox Chase’s moonshot summit.